The Q3DBars class provides methods for rendering 3D bar graphs. This class enables developers to render bar graphs in 3D and to view them by rotating the scene freely. Rotation is done by holding down the right mouse button and moving the mouse. Zooming is done by mouse wheel. Selection, if enabled, is done by left mouse button. The scene can be reset to default camera view by clicking mouse wheel. In touch devices rotation is done by tap-and-move, selection by tap-and-hold and zoom by pinch. If no axes are set explicitly to Q3DBars, temporary default axes with no labels are created. These default axes can be modified via axis accessors, but as soon any axis is set explicitly for the orientation, the default axis for that orientation is destroyed. Q3DBars supports more than one series visible at the same time. It is not necessary for all series to have the same amount of rows and columns. Row and column labels are taken from the first added series, unless explicitly defined to row and column axes. Note: We set the data window to 5 x 5, but we are adding only one row of data. This is ok, the rest of the rows will just be blank. The scene can be rotated, zoomed into, and a bar can be selected to view its value, but no other interaction is included in this minimal code example. You can learn more by familiarizing yourself with the examples provided, like the Bars Example. See also Q3DScatter, Q3DSurface, and Qt Data Visualization C++ Classes. Bar spacing in the X and Z dimensions. See also barSpacingRelative and multiSeriesUniform. This property holds whether spacing is absolute or relative to bar thickness. If it is true, the value of 0.0 means that the bars are placed side-to-side, 1.0 means that a space as wide as the thickness of one bar is left between the bars, and so on. Preset to true. This property holds the bar thickness ratio between the X and Z dimensions. The value 1.0 means that the bars are as wide as they are deep, whereas 0.5 makes them twice as deep as they are wide. Preset to 1.0 by default. This property holds the axis attached to the active column. This property holds the floor level for the bar graph in Y-axis data coordinates. This property holds whether bars are to be scaled with proportions set to a single series bar even if there are multiple series displayed. If set to true, bar spacing will be correctly applied only to the X-axis. Preset to false by default. This property holds the primary series of the graph. This property holds the axis attached to the active row. This property holds the selected series or a null value. If selectionMode has the SelectionMultiSeries flag set, this property holds the series that owns the selected bar. Sets the active value axis (the Y-axis) to axis. Implicitly calls addAxis() to transfer the ownership of axis to this graph. If axis is null, a temporary default axis with no labels and an automatically adjusting range is created. This temporary axis is destroyed if another axis is set explicitly to the same orientation. See also addAxis() and releaseAxis(). 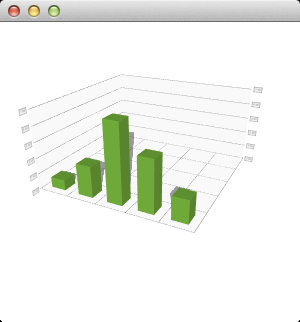 Constructs a new 3D bar graph with optional parent window and surface format. Destroys the 3D bar graph. Adds axis to the graph. The axes added via addAxis are not yet taken to use, addAxis is simply used to give the ownership of the axis to the graph. The axis must not be null or added to another graph. See also releaseAxis(), setValueAxis(), setRowAxis(), and setColumnAxis(). Adds the series to the graph. A graph can contain multiple series, but only one set of axes, so the rows and columns of all series must match for the visualized data to be meaningful. If the graph has multiple visible series, only the primary series will generate the row or column labels on the axes in cases where the labels are not explicitly set to the axes. If the newly added series has specified a selected bar, it will be highlighted and any existing selection will be cleared. Only one added series can have an active selection. Returns the list of all added axes. See also addSeries() and seriesList(). Releases the ownership of the axis back to the caller, if it is added to this graph. If the released axis is in use, a new default axis will be created and set active. If the default axis is released and added back later, it behaves as any other axis would. See also addAxis(), setValueAxis(), setRowAxis(), and setColumnAxis(). Removes the series from the graph. Returns the list of series added to this graph. Sets the axis of the active column to axis. Implicitly calls addAxis() to transfer the ownership of the axis to this graph. If axis is null, a temporary default axis with no labels is created. This temporary axis is destroyed if another axis is set explicitly to the same orientation. Note: Setter function for property columnAxis. See also columnAxis(), addAxis(), and releaseAxis(). Sets series as the primary series of the graph. The primary series determines the row and column axis labels when the labels are not explicitly set to the axes. If series is null, this property resets to default. Defaults to the first added series or zero if no series are added to the graph. Note: Setter function for property primarySeries. Sets the axis of the active row to axis. Implicitly calls addAxis() to transfer the ownership of the axis to this graph. Note: Setter function for property rowAxis. See also rowAxis(), addAxis(), and releaseAxis().